The official fuel economy figures for the self-shifting 2014 Chevrolet Corvette Stingray have hit the web and surprisingly, opting for the 6-speed automatic transmission in the new C7 Corvette doesn’t have a huge negative impact on the MPGs – with a fuel economy rating of 28 miles per gallon on the highway. The 2014 Chevrolet Corvette Stingray Coupe is the most powerful “base model” Corvette ever with 455 horsepower and 460lb-ft of torque (460hp/465tq with the optional performance exhaust system) but thanks to the long list of cutting edge engine features, the 2014 Corvette is also the most efficient. When mated to the optional 6-speed automatic transmission, the 2014 Stingray offers 16 miles per gallon around town, 28mpg on the highway and a combined figure of 20mpg. Those are impressive figures from a sports car with 455 horsepower but more impressively, these numbers are only slightly lower than the manual transmission-equipped C7. With the vast majority of vehicles sold in America today offered with both a manual and automatic transmission – whether they are economy cars, sports cars or utility vehicles - the models fitted with the manual transmission is significantly more efficient than the same vehicle with an automatic transmission. However, with the 2014 Corvette fitted with the standard 7-speed manual transmission, the new Stingray is only 1 mile per gallon better than the self-shifting models in every category (17 city, 21 combined, 29 highway). Better yet, since General Motors has commented that the 2014 Corvette is capable of topping 30 miles per gallon when driven on the highway in Eco mode; owners may be able to exceed the expected figures for both the manual and automatic transmission 2014 Corvette. So the 2014 Corvette is the most fuel efficient in the history of the fabled American performance car but how does it stack up against the competition? 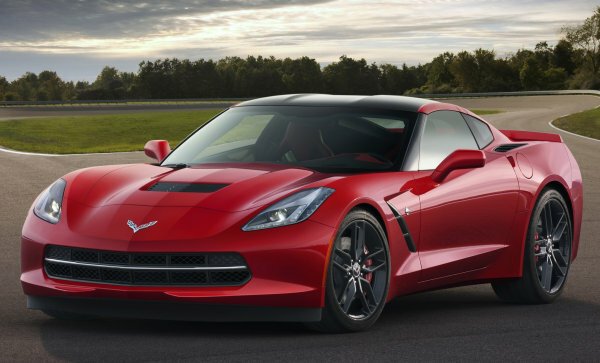 Well, when compared to the Porsche 911 S – the C7 Corvette beats it. The 2014 Porsche 911 Carrera S is one of the key competitors to the 2014 Corvette Stingray with a 400 horsepower Boxer motor mounted to the buyer’s choice of either a 7-speed manual or 7-speed dual clutch transmission. That Porsche offers slightly better fuel economy around town (19mpg for the manual, 20mpg for the dual clutch) but the Porsche falls short on the highway with either transmission (27mpg for the manual and dual clutch. That Porsche also falls short on performance with a 0-60 time of 4.3 seconds for a manual model and 4.1 for the DCT while the Corvette will hit 60 in less than 4 seconds. Oh, that Porsche also comes with a starting price of $98,900 while the new Corvette will set you back just over $50,000. The 2014 Chevrolet Corvette Stingray Coupe offers very impressive fuel economy for a car that such incredible performance capabilities but if any of the recent transmission rumors should prove to be true – we could see a considerable improvement in the Corvette’s fuel economy in the next few years. First, shortly after the 2014 Corvette was introduced, there were rampant rumors that an 8 speed automatic transmission was on the way but more recently, a patent drawing from General Motors for a 7-speed dual clutch automatic has many believing that a Corvette in the near future will sport that high tech technology that has long been used in some of the world’s most powerful self-shifting vehicles. Should General Motors opt for the 8-speed fluid driven automatic, we can expect that the Chevrolet Corvettes relying on that gearbox will achieve better fuel economy and possibly improved performance since the engineers can gear the car more aggressive on the bottom end for stronger acceleration while gearing the car more gently on the top end for low cruising RPMs – which equals better fuel economy. On the other hand, the 7-speed dual clutch automatic transmission would achieve better fuel economy and improved performance for the same reasons as the 8-speed automatic but with the dual clutch setup being lighter and less parasitic than a conventional fluid driven automatic, the DCT Corvette will likely offer even better performance and better fuel economy. It should be kept in mind that in some sports cars sold around the world with dual clutch technology (like the Porsche 911), their “automatic” models offer better performance than those with a manual transmission…leading some companies to go away from manual transmissions altogether. I don’t foresee GM dropping the manual transmission from the Corvette any time soon but the addition of a dual clutch transmission could close the gap between the manual and automatic transmission options for the modern Corvette Stingray. Future improvements aside, the 2014 Chevrolet Corvette Stingray Coupe offers fuel economy capabilities that rival any sports car with comparable performance in the world and with the first units reaching customers last month, we should be hearing about real world fuel economy figures soon.